At some point in our lives we’ll all take a phone call, where immediately we can tell that something is wrong. It’s either because it’s from someone we don’t usually hear from or there’s a detectable strain in the person’s voice. Immediately we hold our breath and pray that everything is okay. Last week, I had one of those phone calls. My mom and my cousin who live in Newfoundland, had been travelling on the highway and had been in a car accident. One that could have quite easily, been much more devastating than it was. While slowed to turn, a truck carrying a full load of jet fuel could not slow down and in order to avoid hitting them, veered around them on the right shoulder. While doing this he collided with their right back bumper and pushed them across the highway and onto the opposite shoulder. Thankfully there was no other traffic and each vehicle was able to stop before hitting the guard rail, which was by this point a barrier between the highway and the water below. At times like this you stop to take stock of the situation and you get a sense that, “if this” or “if that” had happened, the outcome could have been much worse. Which makes you grateful that things turned out the way they did. This got me thinking about my mom and all of the things she’s accomplished over the years. When we were growing up as kids she worked in The Kitchen’s of Sara Lee. I remember as a kid how she would cook, clean and bake all day before heading out for her shift in the afternoon. She always wanted to have food ready for us kids when we came home from school and she couldn’t be there. One of the things she often made were marshmallow squares. The crust was always thick, buttery and flaky and I remember it often crumbled when you bit into it. The marshmallow was super thick, twice as thick as mine (so I think she must have used a 9″ x 9″ pan whereas, I’ve used a 9″ x 13″) and the palest pink. Often they were cut into squares, rolled in fine white coconut and placed out on a sheet of waxed paper in a square Tupperware container. When we came home, all we had to do was peel back that lid and bite into the sticky sweetness. These squares go way back to my grandmother’s era when gelatin desserts were all the rage. The ingredients are simple, right down to the nostalgic Club House food colouring. Not wanting to bother mom for the recipe, I once again thumbed through my Anglican Church Ladies cookbook and found a recipe for Marshmallow Squares and immediately knew I would make these in honour of my mom. I don’t ever remember cherries in them but this particular recipe suggested them, and since my husband loves cherries, I thought that would be the way to go. Mix together and press into a 9″ x 13″ pan. Bake for 20 minutes at 325 degrees F.
Sprinkle gelatin over cold water and let stand to soften. In a saucepan, put sugar and hot water to boil for 2 minutes over high heat. Remove from heat and add gelatin mixture to the hot syrup. Stir until dissolved. Beat in electric mixer until thick and stiff. Fold in cherries, flavouring, and food colouring. Spoon mixture over shortbread and smooth out with a spatula. You can dip your spatula in hot water if the marshmallow is sticking. Cool several hours at room temperature until firm. Cut into squares and sprinkle with, or roll in, coconut. Store in a airtight container. Note: These square would be beautiful cut small and served at a shower. There’s a page in my cookbook that’s tattered and torn, grease stained and smeared with chocolate. There are notes and exclamation marks in the margins, a few things crossed out here and there and some new additions penciled in. It’s the most worn out page in my “Best Recipes This Side of Heaven” Home-Tested Recipes from Anglican Church Ladies, cookbook. The cookbook itself is in poor condition. The pages are dog-eared and stained, the back cover is ripped in half, the front cover is worn, creased and faded and little sticky tabs pop out on every side. It was given to me by my husband’s aunt Mary in 1989, and reminds me fondly of her. For many years it was my most thumbed-through cookbook and as a new mom, helped me get a tasty, if not well-balanced meal on the table. Never underestimate the culinary power of a home-tested church-lady recipe. It can bring you fame, if only at your own kitchen table. There must be a gazillion brownie recipes of various methods and ingredients and everyone seems to have their own personal favourite. 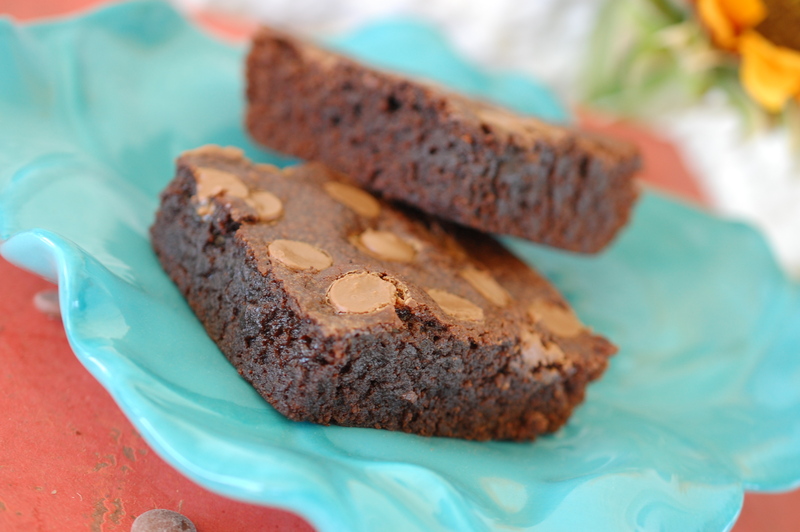 Brownies are like perfume or cologne ~ you have to find the one that suits you. I’ve found one that suits me … perfectly. The surprising thing is, that it isn’t the one that’s all smeared and stained in my Anglican church ladies cookbook. It’s new. Do you want to know a secret about this recipe? It’s been directly above the one I’ve been using for the last 25 years. Sitting there all the time. The one I’d never tried and it took all these years to find. And do you know what my kids said when I asked them how they compared to the ones I had made them for the last quarter century. “Oh, yeah, these are way better! 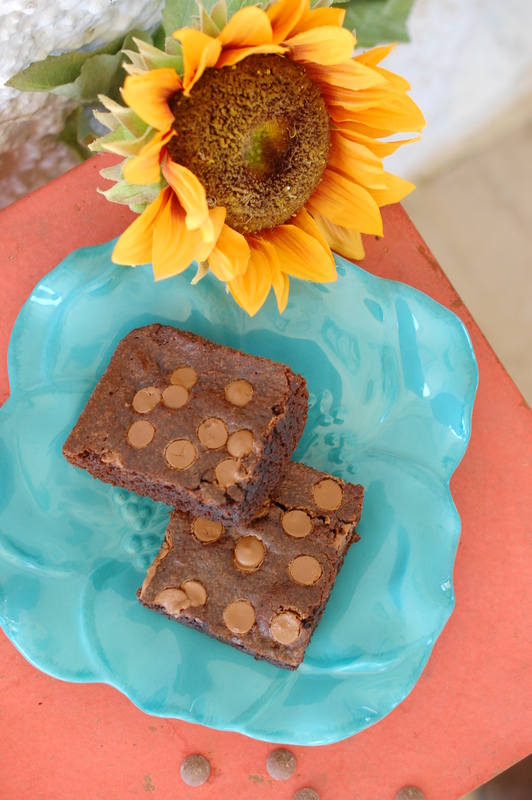 There’s something about brownies that make everything better and these brownies are no exception. 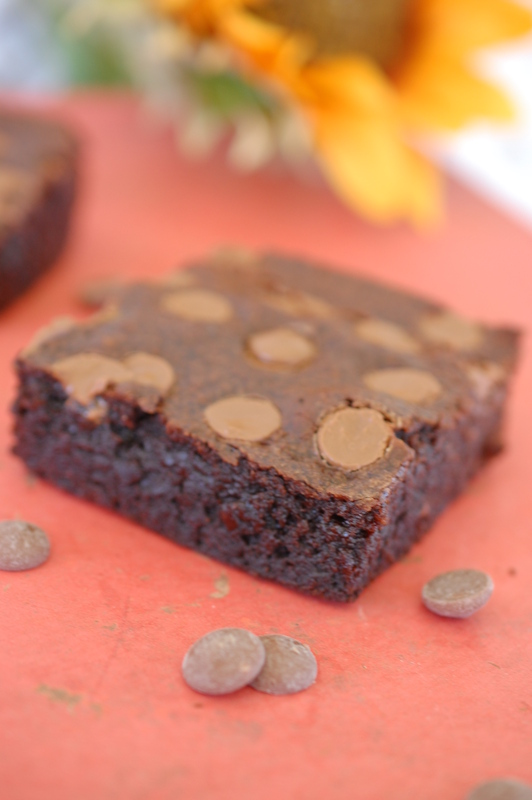 Fudgy, moist and full of satisfying chocolate flavour, they rival my oldest tried and true go-to-brownie recipe. 1. Preheat oven to 325 degrees. Spray a 9″ x 13″ pan with cooking spray and set aside. 2. In a large mixing bowl, stir together the sugar, oil, eggs and vanilla. In a separate medium bowl, whisk together the flour, cocoa, and salt. Add the dry ingredients to the wet ingredients and mix until incorporated. Pour into your prepared pan and spread evenly. Sprinkle with optional chocolate chips and/or nuts. Bake for 25 minutes. Remove pan to a rack to cool completely. Cut into squares and serve. Source: Best Recipes This Side of Heaven, St. Andrew’s church lady in Sidney, B.C. It’s official, it’s here, it’s wonderful and I’m blissfully excited. I hope those who live somewhere close to where I do enjoyed the sweet pleasures of Spring last week as much as I did. It was spectacular! The weather’s been incredibly warm and each day felt a little more like Summer, than Spring. Mother nature’s busy working her magic, transforming everything into a lush green, including the field of spring wheat behind our house, which my husband is awfully excited about. My tulips and daffodils are on notice that it’s time to rise and shine, the buds are on my lilac bushes and the apple blossoms are coming to life. Each day I get a little more excited about all of the wonderful transformations that are taking place. Each one offers up a gift for those who pause to take notice. So I encourage you to take a moment and slip outside. Oh I know, if you’re a blogger like me, you’ve got pictures to take, posting and editing to do. There’s always food waiting to be cooked and laundry piling up, people to email and research to do. It will wait, but mother nature won’t. She takes direction from no one and she waits for no one. She beats to the sound of her own drum and as good as your intentions are, if you don’t take a moment right now, to look, and to listen, and breath deeply, and feel it on your skin and in your lungs, you will miss it. The promises of spring before it truly delivers. The promise of what’s to come but isn’t quite here yet. The mystery of tiny seeds sprouting into their destiny … Hhh hem, okay, I’m coming down off my soapbox now. Truly, I am. Over the course of the past year, I’ve devoted some serious time and some serious ingredients into trying to achieve some sort of mastery competency making cake pops. 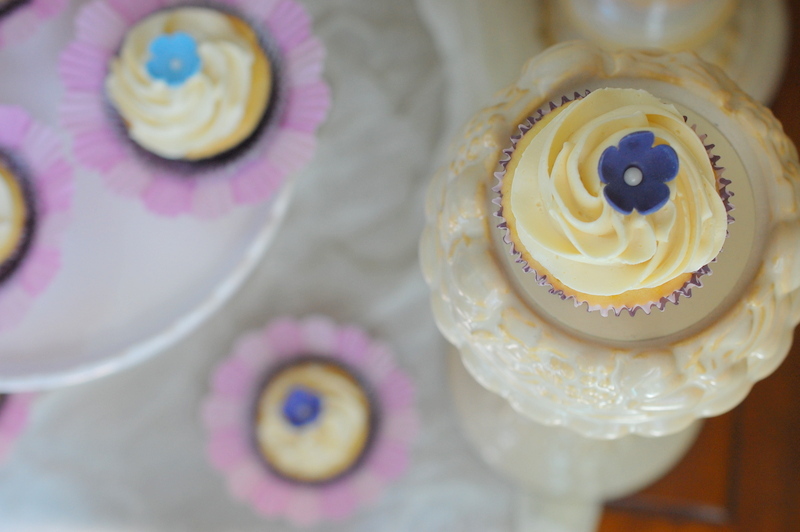 While learning to bake and decorate cakes, I always found that I had large bowls of cake and buttercream left over at the end of the day. 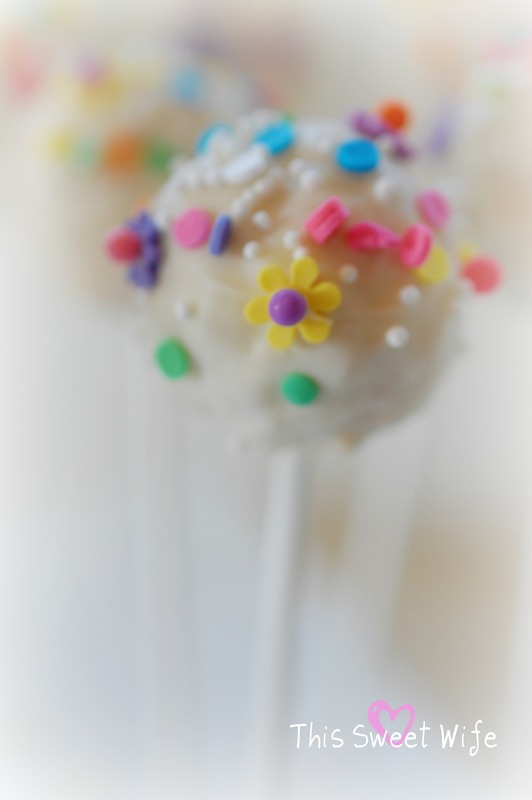 Not one to waste good cake, I delved into the quintessential world of Bakerella to get some advice on her adorable cake pops. Bakerella has some serious off-the-charts talent and there are no limits to the imaginative ways she can dream up to use cake and icing or any dessert ingredient for that matter. This week , however, when I decided that I was going to bring all of my excitement about spring into an awesome baking post, I wasn’t really thinking about Bakerella or cake pops. I rose at dawn and the first thing I did was whip up a half batch of Rice Krispie Marshmallow Treats. Are you thinking what I’m thinking? That’s right. There’s absolutely no baking involved in making marshmallow treats. You don’t even have to preheat the oven. What can I say, I’m a simple girl. The truth is, the first thing I saw in my pantry was a stockpile of marshmallows that needed to be used and I did what I always do with marshmallows. Once I was done, I stared at those marshmallow treats and searched racked my brain for ideas about how to transfer my love of spring to you. I pressed them into cookie cutters, I sprinkled them with stars, rolled them into eggs, I ate some between two wafers of white chocolate. And that’s when I knew what to do. Where have you been all my life? And why have I never thought of you before? Harbor no hard feeling. We now have a serious attraction and I promise I will never stray again. You satisfy every sweet tooth I have. I have to be fair and let you know that these Rice Krispie Pops come with a serious warning. They are quick, easy and highly addictive. Your kids will want them, your friends will want them, your husband, your neighbours, the cat, the dog and everyone in between. They are especially great for kids and parties and I imagine Halloween treats for spooks you know, gift-giving or just plain brightening up someone’s day. So there you have it my friends, I hope that these wonderful treats will bring a little bit of Spring and pop some sweetness into your life, the way it has mine this week. This Easter, why not pop them in a bag, tie it with a bow and spread a little sweetness in your part of the world. 1. In a large pot melt butter over low heat. Once the butter has melted, add the marshmallows and stir until melted. Immediately remove from heat. 2. Add vanilla and stir. 3. Add 3 cups of the Rice Krispie’s cereal and fold with a buttered spatula or large spoon. Add the last 3 cups of cereal and fold again, making sure all of the cereal is coated in the gooey marshmallow coating. Once the Rice Krispie Marshmallow Treats are mixed, do not press them into a pan, leave them in the pot, away from the heat or pile them loosely in a bowl. If you would like a full picture tutorial for making the Rice Krispie Marshmallow Treats on the stove top, you can find it here. Note that for this project I halved the recipe and it’s listed above. In a microwave safe bowl heat butter and marshmallows on HIGH for 2 minutes, stirring after 1 minute. Stir until smooth. Follow steps 2 and 3 above. Please note that not all microwaves are equal and the cooking time may vary.
}} For best results, use fresh marshmallows.
}} Marshmallow crème can be substitued for the marshmallows.
}} Diet, reduced calorie or tub margarine is not recommended. 1 lb. of white chocolate ( I’ve used both Mercken’s White Chocolate Moulding Wafers, available at the Bulk Barn in Canada, or Callebaut Pure White Chocolate, available at Golda’s kitchen, also in Canada, with success. Both melt easily and have good flavour. I prefer Callebaut because it’s made from 100 % pure cocoa butter. Another alternative is to use candy melts by Wilton. Coloured chocolate coating melts (if you would like to add colour to the chocolate coating). 1. Prepare a cookie sheet lined with waxed paper or parchment. 2. Smear both your hands with a small amount of butter and rub together. Using your hands, tear off small pieces of the Rice Krispie Marshmallow mixture and roll it into a ball between both hands until it is round and smooth. 3. Melt a small amount of the chocolate in the microwave (10 second intervals, stopping to stir in-between). Dip one end of the lollipop stick in the chocolate and insert it into the Krispie ball. Repeat until you have a stick in every ball. Allow to set at room temperature for 20 minutes or refrigerate for 10 minutes. 4. In a small microwave-safe bowl, or these candy melt bowls by Wilton, melt your chocolate in the microwave (30 second intervals, stopping to stir in-between). You can colour your chocolate by adding coloured pieces of chocolate along with the white. 5. Dip each ball into the chocolate and indirectly tap off the excess by repeatedly placing two fingers on the wrist of the hand holding the lollipop stick. Place the lollipop sticks into a brick of styrofoam or florist foam to dry. An alternative (and the one I used) is to place them down on a clean piece of waxed paper or parchment to dry. 6. When to add the glitter and/or sprinkles and/or quinns will depend on the temperature of your chocolate. You want to add them before the chocolate sets but not while it is still drippy so that they don’t slide to the bottom, if you wanted them at the top. This may take some practice to get it just right.
}} You can weigh the marshmallow treat mixture on a scale but I found that you need to be very precise or your balls will still be different sizes depending on how tight or loose you roll them. With practise it will get easier to make them all the same size.
}} Never let water come in direct contact with your chocolate or candy coating.
}} Be careful not to over-microwave your chocolate or candy coating because it will seize or burn.
}} If you do not have a microwave, you can use a double-boiler as an alternative for melting.
}} These make great Easter treats~!
}} The possibilities for decorating Rice Krispie Pops are endless. Use your imagination and you will be amazed at all of the ways you can put your own personal signature on them.
}} Most of all, have fun sharing these treats with your family and friends.